The best-known version of this famous tart is made with sugar and cream and generally called “salée au sucre”, but there’s also a savoury version made with bacon and cumin.Simple and delicious, the Vully tart is available in all good bakeries in this Northern Vaudois region and sometimes even beyond. In the Avenches area, it’s made at home, often using a family recipe. 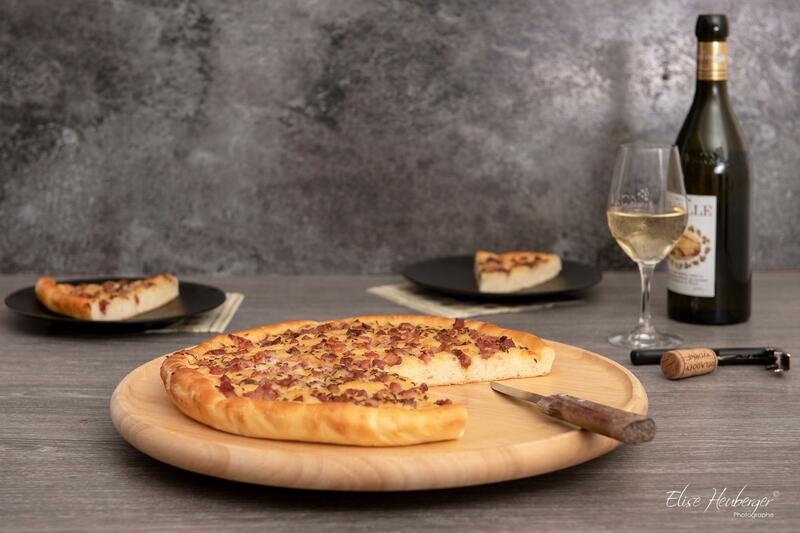 In the olden days, Gâteau du Vully was more common in its savoury version, flavoured with bacon and cumin, and enjoyed with a glass of chasselas as an apéritif. Recipes were shared and exchanged at the communal oven while the tarts were baking. Setting up and directions: approx. 35 min. Cooking in the oven: approx. 20 min. Mix the yeast, 1 tablespoon of milk and ½ tablespoon of sugar in a bowl. Cover and allow to stand for approx. 15 min. until the liquid becomes foamy. Add 30 g melted and cooled butter. Add the flour, ½ tsp. of salt and 1 ½ dl milk. Knead into soft and smooth dough. Put the dough on a greased mould, flatten. Cover and allow to rise at room temperature for approx. 2 hours. Push your fingers into the dough surface to make several hollows. Mix the double cream and the egg yolk, brush the surface of the dough with this preparation. Add the bacon and cumin seeds. Cook for approx. 20 min. in the middle of the oven preheated to 200° C. Remove the cake from the oven.